I’ll start with one of my favorites. RULER is an empire building Roguelike with randomly generated worlds containing various terrain and resource types and inhabited by the uncivilized tribes of various peoples. Your goal is to start settlements, recruit soldiers and construction units, and duke it out with your neighbors as you advance your civilization. Combat takes place between armies, so you always have one unit leading the attack against an enemy. I don’t know much more about it other than I never seem to lose a fight, but it’s a cool concept in which your point unit is the one doing the combat and leveling up while your reserve units are just there in case of loss. This game succeeds in playability and entertainment. The music strikes an appropriate mood, and I enjoyed watching my settlements grow over time. The fact that this was made in 7 days shows in various minor bugs that might impede gameplay but are more likely to give you an unfair advantage (i.e. building settlements without any settlers in your army). Still, it’s a great proof of concept that could easily become my favorite RL from Slashie with a little more polish. For those that are familiar, I found this one much easier to get into than his Expedition. This game is impressive both as a technical achievement and a novel gameplay idea. 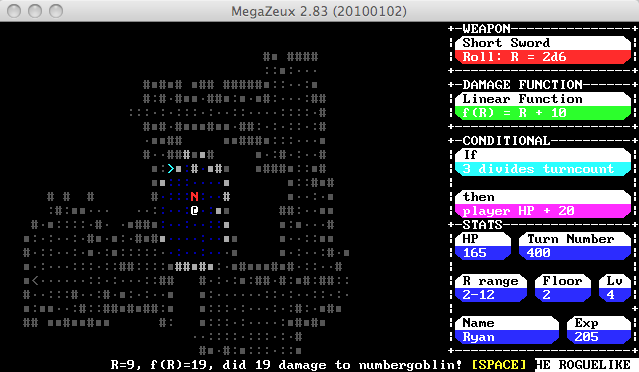 In Math: The Roguelike, your equipment are various bits of pseudo-code you combine to write powerful attack and healing routines. The various items are scattered around simple, randomly generated dungeons that are populated with a single monster whose strength increases the further you descend. With the right combination of items, you can quickly dominate your foes. This game is an impressive technical achievement because of its platform… It was developed as a Megazeux game! Holy cow! I programmed little MZX games over a decade ago with my friends and never imagined someone could achieve this level of complexity in the platform. 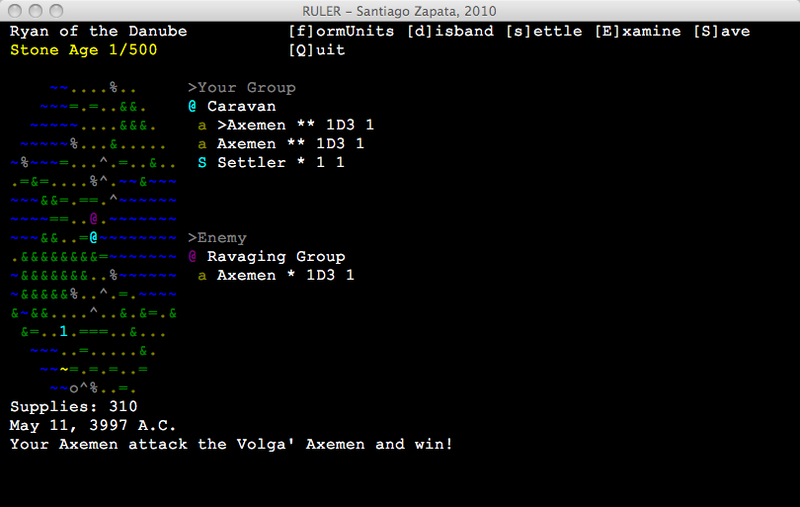 The gameplay controls are simple, the dungeon generation is good, and the UI is actually quite attractive and useful. Verdict: Excellent game good for at least one solid play. Afterward, shop around for other Megazeux titles on DigitalMZX. There are quite a few solid games there. 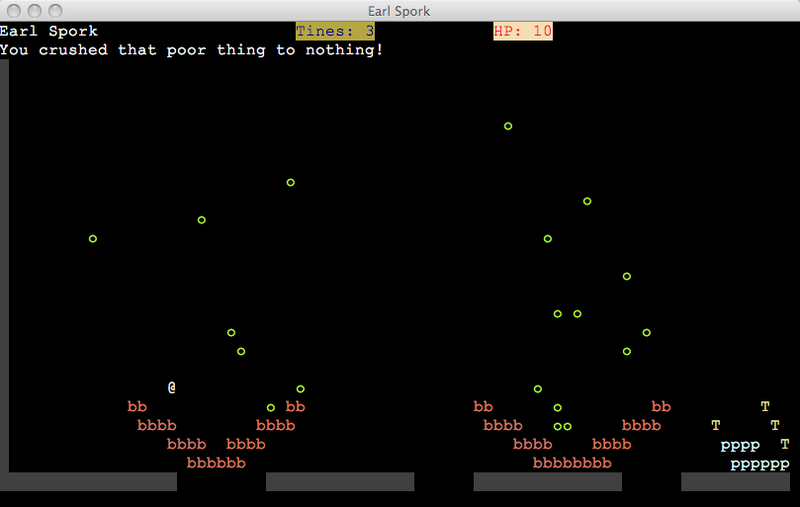 The other gameplay element is glasses full of water that must be shot with fork tines before you can pass them. Watch out for the water, though, as it will kill you. You’ll want to reserve your tines to break glasses, as you have a limited amount and only seem to get more as you level up. Verdict: Play it once to learn the game mechanics and again to try and beat it. Not one of my favorites but a fun diversion nonetheless and a solid game for a 7 day competition. ~ by roguewombat on March 18, 2010. Thanks for the review! I’m glad you liked it!